At RHRLI, we make it our business to transform lives. We help patients every day with our state-of-the-art robotic hair transplant, the ARTAS® System. It’s a minimally invasive procedure that gives patients new, healthy hair. 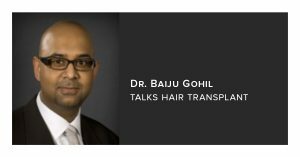 Our doctor Baiju Gohil is the first surgeon to bring this life changing technology to Long Island and we recently sat down with Dr. Gohil to discuss ARTAS®, his practice, and recent trends in hair loss treatment. Dr. Gohil is a board-certified surgeon and a Fellow of the American College of Surgeons, who’s been in practice for more than 20 years. He grew up in Nassau County and wanted to set up shop close to home. “I wanted to stay here, and there also seemed to be a need to start this type of practice in the area,” he says. The time was right because Dr. Gohil, who has always had an interest in emerging medical technology, had seen how robotics have impacted other types of surgery such as bariatric procedures. According to Gohil, hair transplant techniques have advanced over the last few decades, when hair plugs were the predominant hair transplant procedure. They gave way to Follicular Unit Transplantation or FUT, a surgical procedure that involves using a scalpel to harvest hair from strips of skin removed from the scalp. FUT is still performed, but it’s also given way to Follicular Unit Extraction (FUE), which was less invasive but often used an inaccurate handheld device. “ARTAS® is a robotic FUE which offers the most advanced, least invasive, and most accurate hair transplant available,” Gohil says. The improvements in hair restoration technology are showing in the numbers of people who are seeking treatment for hair loss. According to the International Society of Hair Restoration Surgery (ISHRS) there were 635,189 patients who’ve had surgical hair treatment worldwide in 2016, the last year we had statistics. That’s a 60 percent hike from 2014. In the U.S., there were 133,136 surgery patients, an 18 percent increase over 2014. If you add surgical and non-surgical patients there’s a total of 1,838,946 patients worldwide, a 74 percent increase from 2014, with 388,826 total US patients. Among the surgical patients in the U.S., 85.7 percent were male, 14.3 percent were female. Among non-surgical patients 61.8 percent are male and 38.2 percent are female. In terms of age more than half of both male and female patients worldwide were between the ages of 30-49, with 59.7 percent of men and 59 percent of women falling in that age range. In addition to looking younger, RHRLI patients often come away from the ARTAS® transplant having reinvented themselves. “I guess the most rewarding part is how much we really do change people’s lives,” Dr. Gohil says. “I can’t tell you how many people have come back to me and have told me they have a new job, they have a new girlfriend, they have more confidence because of this life changing procedure.” You can change your life too. To get started, contact RHRLI today.